The EU region saw its sentiment gauge drop to 104.8 in July from 105.7 in June in the wake of the U.K. Brexit vote. A good deal of this weakness is from the U.K. itself, still an EU member, whose own index fell by 4.1% month-to-month. Interestingly, in EMU sentiment gained 0.2% in July after dropping 0.2% in June. The EU-wide industrial sector that had improved in June held most of that gain, giving back just a tick in July. The sector has been posting more or less the same ratings since late-2013. Consumer confidence in EU fell sharply, dropping to a -7.6 reading, its worst since December 2014. Retail stepped back to a 1.1 reading after posting a 1.6 reading in June. Retailing has been sliding since it reached its cycle peak in October of last year. Construction improved to a -14 reading from -15 in June, extending its long slow and relatively isolated improving glide to better readings. The services sector which peaked in December 2015 at 15.3 continues its erosion, dropping to 9.0 in July from 9.4 in June. The trends in EU are not simply the product of Brexit this past month, but part of an ongoing process of erosion. Maybe that is why the Brexit vote was not such a jolt to Europe. It was not a 180-degree turn. It was not a slam on of the brakes. It was an exit from a freeway that was backed up and hardly even moving. No surprise, really, despite the fact that it was not well anticipated. Six of 17 reporting EMU nations saw their overall economic sentiment indexes fall in July while 11 saw improvement month-to-month. Only Greece has a sentiment standing that ranks below its historic 20th percentile. 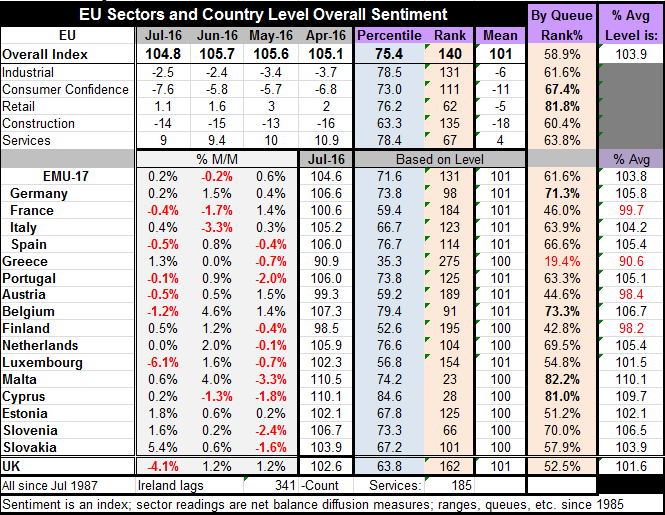 Apart from Greece, France, Austria and Finland have the lowest relative readings with sentiment standings in the 40th percentile range for all of them. Tiny Malta and Cyprus have the highest percentile standings in their low 80th percentiles. Among the four largest economies, Germany has the highest percentile standing at a 71st percentile queue reading. The EMU region as a whole has a 61.6 percentile standing that is now ahead of the 58.9 percentile standing for all of EU. The standing for the U.K. has dropped to its 52nd percentile, its weakest reading since June 2013. The extremes of good and bad country level performance are now mostly gone and much of EMU now sees its EU index resides in the middle range. Eleven of 17 members have queue percentile standings for overall sentiment in their 50th to 79th percentile range; the Goldilocks zone where conditions are neither too hot nor too cold. Still, the overall EMU standing in its 61st percentile represents a very mediocre standing. The EU region sustained only 11 EU Index rankings in its 70th percentile in the recovery period with the highest reading of a 78th percentile standing coming in December 2015 flanked by standings in the 73rd and 72nd percentile. The EU as a region has had a hard time posting and keeping anything like an elevated reading compared to its pre-financial crisis days. The EMU region has had only three 70th percentile range readings in the post-recession period. Is it a legacy of Brexit or a legacy Brexit leaving behind? Brexit (so far) does not seem to be a catalyst for a worsening of conditions (or of perceived conditions) in the EU and EMU except perhaps for the U.K., itself. Instead, the U.K. Brexit vote looks more like something that was spun out of an outgoing process of worsening conditions. This will be the trend to keep an eye. Will the EU and EMU continue to worsen in the period ahead or to be mired in this same morass of mediocrity? And if so, is mediocrity good enough; is it sustainable? Or will the U.K. Brexit be the kick in the rump that the EU/EMU needed to make some of the needed changes, bang (!) to kick things up a notch?